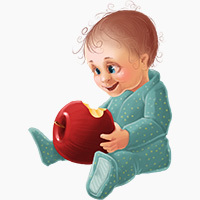 It’s pretty clear that a father’s diet can affect the baby after birth – children tend to learn eating habits from their parents, so if Mom and Dad setting a bad example, it’s more likely that the children will learn bad habits. And it’s pretty well-known that a woman’s diet before and during pregnancy can have a big impact on the health of the mother and the baby. But did you know that the father’s diet before conception is also important? A man’s diet can affect what genes get expressed in his sperm and then passed on to the baby. New researchers have shown that this has serious consequences for the baby’s risk of birth defects, obesity, and chronic disease later on. It’s counterintuitive, but here’s a look at the evidence. 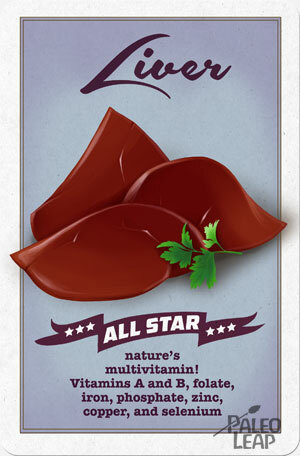 Liver is naturally rich in folate…and all other kinds of good stuff! in all kinds of prenatal supplements and fortified foods. Deficiency of folate in the mother’s diet can cause birth defects, especially problems with the brain and spinal cord. But the study’s results suggested that the folate in a father’s diet might also have a huge effect on the ultimate health of the baby. The researchers looked at male rats, because “here, let’s deprive you of an essential nutrient and see if your baby has horrible birth defects!” is not an ethical thing to do to people, but they thought the results were applicable to humans. Folate-deficient diets in the male rats made their children more likely to have birth defects, and altered genes associated with chronic diseases like diabetes and cancer. How does that make any sense? Epigenetics! Epigenetics is basically how your diet affects gene expression. You can’t change the genes you have, but you can change which ones get turned on and off. The father’s diet can make changes to the way genes are expressed in his sperm, which will affect the way that the baby’s genes are expressed later down the line. B vitamins are particularly important for affecting one type of epigenetic change, called methylation, which is why B9 is particularly powerful. Another epigenetic effect of the father’s diet on his children’s health comes through diet-induced obesity. New research has shown obesity might cause epigenetic changes in sperm DNA that make a baby more susceptible to obesity and metabolic damage. Again, most of this is in rats, but it’s still interesting and backs up some of the association studies we have in humans. We found that [a diet designed to imitate Western fast food], which induces paternal obesity in the absence of altered glucose homeostasis, impairs glucose tolerance in both male and female offspring due to insulin resistance and also induces obesity in females and hyperleptinemia in males. Translation: female children born to obese fathers were more likely to be obese and have problems metabolizing carbohydrates. Male children weren’t statistically more likely to be obese, but they did have problems with the hormone leptin, which is a powerful regulator of bodyweight and appetite. This study took male rats and basically fed them a fast-food diet until they were obese and diabetic. The researchers found that the female children of those fathers had significant changes in the genes controlling insulin secretion from the pancreas. The children’s insulin sensitivity and glucose tolerance that started out bad and got worse over time. The “diet-induced” part of diet-induced obesity is important, because it’s not clear whether the obesity per se causes these changes, or whether it’s the diet (or both). In other words, one of those metabolically blessed people who can stay thin on a fast-food diet might still have reason to worry about what kinds of epigenetic changes he’s passing on to his children, even if he’s at a normal weight himself. Feasting and Fasting: Opposite Effects in Women and Men? Several studies have shown that when mothers endure food scarcity, their children are more likely to be obese, because the fetus gets “programmed” in the womb to deal with an environment where food is precious. But actually, the opposite may be true for fathers. This fits with evidence from humans showing that if a father overate as a child, his children are more likely to die of diabetes. On the other hand, if the father was born during a year when food wasn’t very available and he probably would have been hungry as a child, his children were protected from cardiovascular disease. In this study, the researchers took male rats and made them fast (go without food) before mating. The more they made the fathers fast, the better the children’s blood sugar control was. That would fit with the theory that fasting and intermittent fasting affects women and men differently, and that (in general! There are exceptions!) more men seem to benefit from it. Do We Know Enough to Make Recommendations? Make sure he’s getting enough folate (liver and green leafy vegetables). As for specific fasting protocols or anything else – there just isn’t enough research to get into it. Women’s diets during conception and pregnancy get a lot of scrutiny (and often some really holier-than-thou judgment, which never helps).This isn’t about extending diet perfection judgment to men as well as women! But presuming that fathers are just as invested in the health of their future children as mothers are, it’s important for men to know that what they eat before conception can affect their baby for his or her whole life. Folate seems to be important, and so does not gorging on junk food (in general, not gorging on junk food always tends to be a good plan). Fasting occasionally might be helpful. Most of these studies are really new, so keep an eye out for more research coming down the line!